Eco tops are available in Eco Rectangular or Eco Curve options. The Eco Curve has a gently sloping front edge that's easy on the wrists and eyes. Eco Curve UV-cured powder-coated desktops are made of 100% recycled wood composite and are available in black or white color options. Choose the Eco option for a classic rectangular desktop. The Eco Curve features a uniquely curved design that allows you to reach more of your work area and rest your wrists in comfort on the desk's front edge. 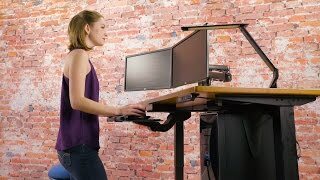 Height adjustable desks alleviate a lot of the issues that come with office work: repetitive stress injuries like Carpal Tunnel Syndrome, neck strain, and back pain. They also allow users the freedom to sit and stand in postures that are better for their bodies, improving circulation, increasing concentration, and helping them be more productive at work. When you're ready to take a stand, Eco Curve Stand Up Desks by UPLIFT Desk are your sit-stand solutions to get you the ergonomic workspace you need to work better. Enjoy your workday at an eco-friendly desk that allows you to work in much more comfort. Now you can build the affordable sit-stand workstation you've always wanted. The desk smoothly raises and lowers in seconds with the simple press of a button, uplifting your work to you preferred sitting and standing levels. Our Eco Curve desktops feature a softly-beveled edge on the side closest to you, allowing you to get closer to your work and stay within your Neutral Reach Zone. Working with limited space? The UPLIFT Space Saver Standing Desk has our most popular Eco desktops in 24" depths. Employ the Eco Curve Stand Up Desk to do all of the heavy lifting of adjusting your workstation in mere seconds. This desk is height adjustable from 24.4" to 50.0” (without desktop thickness). Our Eco desktop is 3/4" thick. Our 3-stage columns offer 25.6" (650mm) of vertical travel. The dual-motor design makes the desk quieter when raising and lowering, safer, stronger, and more reliable than other sit-stand desks on the market. A width-adjustable frame expands easily to fit desktops of different sizes, and a hidden crossbar gives you more legroom or space to mount your desk accessories underneath. Fully customizable by size, desktop choice, frame color, and add-on accessories, this is the perfect desk for users who want to individualize their desks to their wants and needs. You don't have to worry about harsh chemicals and wood sealants - we take the time and care to only use the most health-conscious and eco-friendly finishes to protect both your desk and your indoor air quality. Our UPLIFT Eco desks are UV-cured, powder-coated to perfection, and made with recycled wood composite core, qualifying it for LEED credits. Accessorize your desk to the extreme, or at least until you're comfy. Whether you want better desk organization or a comfier keyboard tray or ergonomic mouse platform, we have the options to get you working in healthier postures now. If you're looking for a different style of desktop, try building a laminate, a bamboo, reclaimed wood, or premium solid wood adjustable height office desk. To learn more about the UPLIFT V2 Frame and UPLIFT V2 Commercial Frame, click here. How durable is the Eco Curve desktop? UPLIFT Desk Eco Curve desktops are made to be durable and will stand up well to the weathers of work. The Eco desktop is made of 100% recycled wood MDF, which is stronger and denser than particle board. The Eco desktop is more scratch resistant while the laminate desktop is more resistant to moisture or spills. Are there any special instructions for the care of the Eco Curve desktop? We have specific care instructions available for download on the site. You will want to use coasters with very hot or very cold cups or plates and avoid cleaners with ammonia. You will also want to use a hard writing surface on your Eco Curve desktop, such as a clipboard, to avoid leaving indentations or scratches if you tend to write with force. What is the Eco top made of? The Eco top has a recycled wood MDF core and is powder coated for a seamless finish. It’s similar in appearance to our laminate desks, but slightly thinner with no border running around the edge. Does this desktop come in a thicker option than .75"? The Eco Curve is only offered in .75" thickness. Is the 42" wide desktop available with a Curve? Not at this time. Space is very precious on the 42" wide desktop and therefore it is not available with the ergonomic center curve. Does the Eco Curve top come in colors other than black and white? Currently, the Eco Curve desktop comes in black or white color options. Can I get the Eco Curve top in a custom size/shape? Unfortunately we are unable to do custom sizes and shapes in the Eco desktop. If you need a custom size or shape, we can craft a custom Wilsonart laminate desktop for you. Contact our customer service pros for more info! Can I get a sample of the Eco top? Samples of the Eco desktops are not available at this time. Does the Eco Curve top have rounded corners or sharp corners? The corners on our Eco Curve top are curved while the corners of the laminate desktop are square. What are those little holes underneath my desk on left and right sides? These are pilot holes for your keypad or advanced digital keypad! Simply choose which side you want to install it on and get to work. Yes! If you have your own desktop, you may purchase just the UPLIFT Desk frame without a desktop. How easy is this desk to put the desk together? Will I need more than one person? If you already own a keyboard tray, monitor arm, or CPU holder, you can certainly add these favorite accessories to your desk. Just double check the manufacturer's instructions to make sure that your accessory is compatible with the thickness of the desktop. Keep in mind that the crossbar on the UPLIFT desk may run across the center of the desk, depending on the size of your desktop, and may get in the way of a keyboard tray or CPU holder. Does the desk always have to be plugged in, or can I unplug it when it's not in use? The UPLIFT Desk frame should be plugged in all the time. The low-draw power supply will minimize electricity consumption. Can I add grommets to my desk after I have already received it? If you change your mind and want a different type of grommet for your desk, you may always order Wire Grommets or Power Grommets separately. What if I live outside of the United States. Will this desk work with my outlets and voltage? In a majority of cases, yes. All UPLIFT Desks are designed to run on the US electricity standard of 120V. If you're ordering an UPLIFT Desk from outside the States (excluding Canada), you'll probably need to plug your desk into a step down transformer first, otherwise you run the risk of overloading your desk's control box, which is not covered by warranty. Please contact our support team if you have any questions and we can help you figure out if your outlets and voltage work with these desks. Is it difficult to tell which version of control box is on my UPLIFT Desk? Nope! You can quickly confirm which version of control box you have on your desk by taking a peek at the silver label on it. If that says v4.1, v4.2, or v4.3, you know you have the newest version of UPLIFT Desk's control box, complete with new features! You're going to love these new features. UPLIFT Desk's version 4 control boxes come with a new safety feature: Collision Sensitivity. When activated, this feature allows you to set the sensitivity for your desk, so when you adjust for height, the desk stops when it touches an object, instead of raising and lowering, which can cause accidents in your work area. Keypad Lockout is another function that adds another level of safety to your UPLIFT Desk. Stop unwanted hands from raising and lowering the desk when this feature is on. You'll be able to toggle quickly between One-Touch and Constant-Touch modes, and also switch between inches and centimeters on the keypad with just a few buttons. If you want more freedom to adjust higher and lower, you'll want a three-stage frame powering your sit-stand desk. Some brands use cheaper two-stage frames that don't offer the same height adjustability, which doesn't fit as many users, petite or tall users. UPLIFT Desk's three-stage frames even allow you the extra height you need to add a treadmill to your workstation. All 2-leg UPLIFT Desks come with a dual-motor design, so each leg gets its own. This makes UPLIFT Desks quieter to adjust, stronger, more reliable, and safer than desks with just a single motor. What happens if my desk stops working outside of the warranty period? We offer replacement parts for all UPLIFT Desk models if your desk malfunctions after the warranty period has ended. Does the desk come pre-drilled with holes for assembly? We pre-drill guide holes for the frame and the desk’s keypad. You can choose to use these guide holes or drill your own if you would like to adjust the frame. This desk is highly customizable, but we do not pre-drill guide holes for accessories so that you can place them in any configuration you choose. $515.00 List Price: $899.00* The list price is the same as the MSRP (Manufacturer's Suggested Retail Price). It may not necessarily be the price at which the product is sold.